If you take a look into the world of the best pH meters, you can see that they have many uses. A pH meter is useful for both beer brewers and aquarium enthusiasts. Besides that, pH meters are useful for hydroponics, optimizing soil/water quality and lab use. A pH meter is usually easy to find. Depending on the use, you should find affordable options. How to Use a pH Meter Step by Step? How to Test Soil pH with pH Meter? How to Calibrate pH Meter Without Solution? How Often to Calibrate pH Meter? Today, you can find many devices for measuring the pH level of something. But when you look around, it’s easy to see why a pH meter is better than the rest. There are many advantages of using a pH meter over a pH testing strip or some other form of measurement. One of the main reasons is that a pH meter is much more accurate than a strip tester is. Once you calibrate your meter, it gives you a straightforward reading that’s understandable. There’s not really any room for doubt or confusion. Using a pH meter is also just very objective compared to reading a color pH testing strip. These strips tend to vary by color and brand, so getting a reading depends on how you think the colors look. A pH meter just gives you a simple number that’s easy to understand and the same across the board. A pH meter also has the advantage of being reusable. You don’t have to throw it away after a single use like most pH measuring tools. You can measure with a single meter as many times as you like, saving you money and convenience. A big deciding factor when it comes to buying a pH meter is accurate and sensitive. Here’s a list of most accurate pH meters available on the market today. 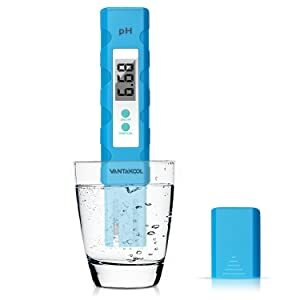 VantaKool Digital PH Meter Household Drinking Water, Lab uses, Pools, Aquariums, Spas, Hydroponics, Food, Wine and Beer Making and more. 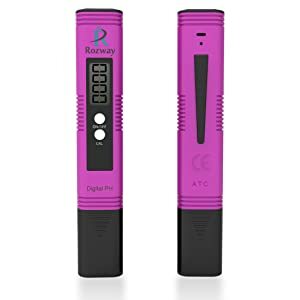 Rozway Digital PH Meter Home and Lab uses; Water, Pools, Aquariums, Spas, Hydroponics, Food, Wine and Beer Making and more. Sonkir Soil pH Meter Soil Test Tool Kit for Home Plants, Garden, Lawn and Farm. The first on the list is the VantaKool digital pH meter. This first contender has some very good qualities, making it a great option for first-time buyers. This functions as a thermometer for the water and a pH meter. The VantaKool digital pH meter is self-sufficient. It’s easily calibrated with a single touch and doesn’t take a long time doing it. It provides instant pH readings for both the temperature and the water quality. The VantaKool digital pH meter also comes with a useful one year warranty for if you’re not satisfied. Combined with its amazing low price, this is definitely an option for someone who wants to save money. Wide uses: Ideal use to test for water, pools, aquariums, spas, hydroponics, food, wine and beer making and more. Next up is the Rozway digital pH meter. 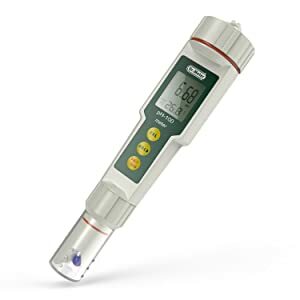 This pH meter stands out from the rest of the meters for its excellent quality and craft. This meter is good for using in pools, aquariums, hydroponics, and food and beer brewing. One of the main good qualities about the Rozway pH meter is the great amount of ease it creates for the user. It’s portable and very lightweight. You can easily put it into your bag or backpack for carrying and travel. This even comes with a case and a bright LCD reading light for the readings. There’s even a one year warranty and money-back guarantee for buyers. One negative point about the Rozway digital meter is that the instructions are vague. If you’ve never used a pH meter, especially a digital one, this is particularly tricky. It’s not recommended to calibrate and utilize a pH meter unless you know what you’re doing. 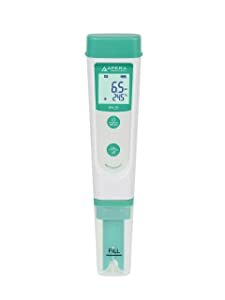 Third on the list is the Apera Instruments waterproof pH tester. This is another great example of a quality starter pH reader. This meter is powered by batteries, so it’s long-lasting and gives up to 2,000 hours of continuous runtime. This meter comes with auto calibration, so you don’t have to worry about that. It’s also equipped with an excellent pH sensor to give you a high response rate. The Apera pH tester includes a lanyard, two buffer solutions, and a carrying case. Customers get a two-year warranty with this product for any returns or problems with usage. One con for this meter is that it’s a bit difficult to calibrate. It often takes more than one try to get it calibrated correctly. Even then, some customers had to cross check it with another meter to make sure it was correct. The next pH meter is the Dr.meter PH100-V device. This is yet another digital that provides excellent readings. You can use it anywhere you want to measure the acidity and alkalinity of the liquid. Dr.meter has many other high-quality products other than this pH meter. That helps provide a wide range of tools you can use to sort out your needs. The Dr. meter has a warranty for one year and comes with its own package. One negative thing is that some have complained of poor customer service for this meter. It’s not an everyday occurrence, but going that extra mile to meet the needs of your customers shows a lot. It shows that you’re standing behind your product and that you trust it to perform well. 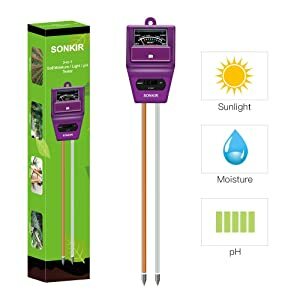 If you want something for gardening, the Sonkir Soil pH Meter Moisture Gardening is right for you. This pH meter helps you measure the pH levels of the soil and water. This allows you to reach specific levels of acidity and alkalinity for plants. This combines many functions into one. This meter lets you know if the soil is in good condition. It even tells you if your plant needs more sunlight and water. The Sonkir Soil pH meter comes with a one year warranty and can be used both indoors and outdoors. It’s got a very easy-to-use design that doesn’t require any batteries. The only negative thing that can be said about this meter is the accuracy. The accuracy of the readings tends to waver a bit. Your readings may be a few points off. This may not be a big deal for some plant owners, but it really depends on the type of plant you have. Some plants require very specific conditions, while others are more forgiving. If you’re looking for something very accurate, try a different option. Last, but not least, we have the Bluelab combo meter for plant germination. This pH meter is also more geared towards plants rather than water. It combines a few different measures into one device. 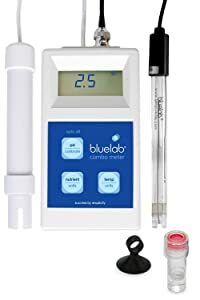 The Bluelab combo meter is used to measure pH levels, conductivity, and temperature. It’s a three in one combo! That saves you money and time in the long run from having to buy other devices for these tests. The Bluelab combo meter has a large display that’s easy to read and comes with its own batteries. Speaking of batteries, it comes with a low-battery warning for you to know when it’s time to switch them out. An important thing to mention about this meter is that the probe is very sensitive. You have to be very careful with how you use it to avoid damaging the delicate design. This may not be a suitable option for long-lasting equipment unless you’re careful. Once you’ve picked the type of pH meter you need, it’s time to learn how to use it. Every pH meter is a little different from the next. The best way to figure out how to use a specific meter is to look at the directions. A general step-by-step way you can use a pH meter begins with calibrating your meter. Start the calibration process by collecting your solutions and the pH electrode probe. Once you’ve gathered your materials, clean the electrode probe with deionized water. Then blot dry with a tissue. Add the electrode probe into a solution of pH 7. Allow it to stabilize, then program the meter to read 7. This sets it up for the next time you use it. After that, do the same process, except with a buffer solution of pH 2. Add the electrode to the solution, allow it to stabilize, then set the electrode to pH 2. Remove it from the solution, rinse, then wipe it with a tissue. At this point, you’re ready to use your pH meter! Make sure to follow any additional directions for calibration before using your probes. If you’re ready to begin, start by turning on the meter and giving it a few minutes to adjust. Make sure it’s on pH mode and that it’s had some time to stabilize. Put the electrode probe in the sample that you want to test. Let it sit there for a few minutes to get a good reading. Allow it to stabilize before noting the reading. Once it’s stabilized, you can take that reading on the display. Make sure to rinse the pH meter and put it back into your storage solution. If you want to test your soil with a pH meter, you have to follow a slightly different path. Again, make sure to read any directions on your pH meter for soil use before starting. To begin, start by picking a place in your soil that isn’t occupied too closely by plants or shrubs. Dig a hole in this clear area that’s about two to four inches deep. Make sure there’s nothing blocking the hole or any twigs in the way. Next, pour distilled water into the hole. You can’t use tap or regular water for this step because the water needs to be completely basic. Using any other water is too basic or acidic to make the cut. As your hole turns into mud with the water, add in your electrode probe. Let it sit for a few minutes as it adjusts and gathers a reading. Once time has passed, take note of the reading you have, and you’re done! You can get a more thorough understanding of your soil’s pH by testing different areas. Dig a few small holes around your soil to check all around and get a more accurate representation of the pH levels. If you don’t have any buffering solution, you can still calibrate your meter with the homemade stuff! This isn’t as accurate as the stuff you can get at the store, but it’s still pretty close. Begin by adding tap water to a container. Fill it up about 80% of the way. Once that’s done, begin adding mono potassium phosphate, or MKP. Add it slowly until you’ve added about 10 grams. Stir the solution until it dissolves. Then, slowly add potassium hydroxide, or KOH, to bring the pH up to seven. You should be testing your water as you’re adding this in to get it up to 7. If done correctly, this gives you a solution you can use for the pH 7 buffer. Now you need to make a buffer for pH 4. Do the same steps, except add 20 grams of citric acid instead of MKP. Add KOH until you’ve gone down to pH 4. Let the buffers sit untouched for a few hours to settle and really get their pH level. Once some time has passed, your homemade solutions are ready to go! You can use this solution just like you would use a store-bought one. You can use it to measure the acidity or alkalinity of your solutions, as well as to reset your probes pH levels. Calibrating your pH meter is what makes it work its best. So, how often should you be calibrating it for good results? It depends on a few things. For starters, pH meters with high accuracy need to be re-calibrated before every use. General meters can be calibrated every week or so. There are some cases when you should calibrate your pH meters, whether it’s got high accuracy or not. An example would be when you haven’t used the electrode in a long time or when it’s brand new. You should also calibrate it after you’ve measured a strong base or a strongly acidic solution. If there was a big difference between the temperature of the buffer and the item you tested, you should also calibrate again. Once you become more familiar with how pH meters work, you begin to appreciate how useful they are. Their benefits span many fields, from food and drinks to chemistry and biology. The process of calibrating and using a pH meter seems difficult, but once you get the hang of it, it’s very simple. You can use these pH meters in your aquariums to ensure that your fish are living in water that’s just right for them. Too basic or acidic isn’t good, so you’re helping to keep your fish healthy when you keep the pH levels in check. With your love and care, your fish can spend the rest of their lives in a well-balanced and safe environment.